Are you wondering how to increase repeat sales in your eCommerce store? It is easier to sell to your existing customers than to acquire new ones. Sadly, many ecommerce businesses focus heavily on acquiring new customers while undervaluing the importance of investing in relationship marketing and encouraging repeat purchases. In this article, we’ve compiled a list of eCommerce customer retention strategies that help you boost your repurchase rate. Email marketing is an essential strategy for building and nurturing a relationship with your potential and existing customers. After collecting emails, you can start strengthening your relationship by sending onboarding emails to welcome new customers and help them learn the value of your product. As your relationship grows, you can promote your products and offer incentives to encourage repeat purchases. 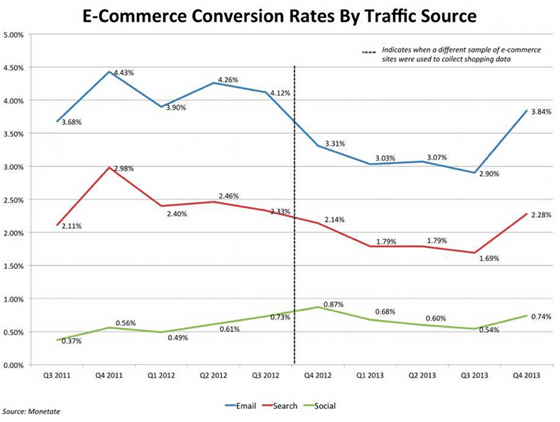 According to Monetate, email conversion outperforms both social and organic search traffic and it is even close to twice as high as organic search. Offer special discounts to your email subscribers and encourage visitors to subscribe to your list. You can use OptinMonster to create a highly customized and targeted list building campaign. Sending personalized emails is the secret to driving email conversions. You can collect onsite behavior of your customers and send personalized emails based on it. Unless you track your email campaigns, you won’t be able to identify what works and what doesn’t to drive sales. To identify the best performing emails, you can use trackable URLs in your emails and analyze the performance of your campaign in Google Analytics. Learn how to find your most profitable email campaigns in Google Analytics. Just like email marketing, persuading people to register an account on your site is a great strategy to boost your repurchase rate. When you require users to register an account, you get essential details of your customers, which you can use to show personalized onsite and offsite marketing campaigns. You can also use it to personalize shopping experience by suggesting products that are more likely to buy. Although forcing account registration can improve repurchase sales, the downside is that customers perceive it as a barrier, which makes them leave your site without even purchasing a single product. To tackle this, you might enable guest checkout on your eCommerce store for those who are in a hurry. With MonsterInsights, you can enable individual eCommerce customer tracking and compare guest checkout against login checkout. That said, emphasizing guest checkout wouldn’t be a good strategy in the long run for customer retention. To improve repurchase rate, you can avoid asking too much information while registering. Not only will it encourage users to create an account during the checkout, but it also helps you to provide a personalized shopping experience for individual customers. If you want to collect more customer details, make sure to tell them why each field is required. Take a look at an example of ASOS. They ask customers to specify their gender, which can help them tailor user experience. Using WPForms is the easiest way to create a customized registration form that you can embed anywhere on your site. Plus, it also helps you automatically add your customers to your email list, which can also strengthen the bond with your customers. Earning customer satisfaction is an important step for encouraging repeat purchases. To earn customer satisfaction, you’ll need to keep every promise you make. For example, if you’re offering one-day delivery to your customers’ doorstep, but you can’t uphold it, it’s in your best interest to put that offer on hold, or you’ll lose customer trust in turn repurchase rate decline. Under promising and over delivering is a great strategy to boost your repurchase rate. When customers notice that you cross their expectations, you gain their trust, which will encourage them to spend more on your store. According to RJMetrics, only 32% of customers make a repeat purchase over the course of the first year as a customer. That means likely, most of your first-time customers will never return to your site after their first purchase. While this is quite normal because chances are most customers look for filling an immediate need, and are not interested in an engaging relationship with your website. However, in order to encourage repeat purchases, it is advised to understand why your customers leave after their first purchase. This can be done by conducting an inactivity survey among your lapsed customers. 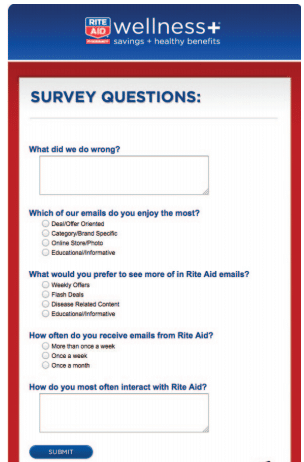 For example, Rite Aid reaches out to their lapsed customers with an incentivized survey to understand the reason for their inactivity. This way, you can understand what makes people leave your site. You can make use of these insights to weed out the loopholes in your retention strategy. We hope this guide helped you to increase repurchasing rate of your eCommerce store. If you want to retain your customers with remarketing, read these remarketing best practices to boost your bottom line. And don’t forget to follow us on Twitter and Facebook for more Google Analytics tutorials.